Polaris Ranger Parts Buyer's Guide to Best Deals. Buyer's Guide to the Best Deals. If you're looking for Polaris Ranger parts, you came to the right place! We'll give you the latest rundown on the most popular Ranger parts and accessories. Then tell you where to find the best deals on them. Don't worry, we haven't forgotten about the Ranger RZR, RZR-S, and RZR-4. You can find parts for them in the same section. After all, half the fun of owning a Ranger is all the cool stuff you can bolt on one! Polaris Ranger Wheels and Tires - Many owners want to change wheels and tires to something better suited for the terrain they ride. Larger wheels and tires with a more aggressive tread are the most popular. Polaris Ranger Winches - We think a winch is a necessity on an ATV as heavy as a Ranger. You aren't moving one of these by yourself! Speaking of weight - be sure to get a winch rated for the heavier weight of the Ranger. Lighter duty winches won't get the job done and could get you stranded on the trail. 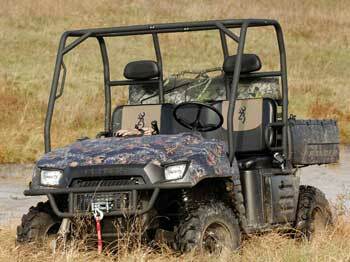 Polaris Ranger Windshields - Front windshields come in a variety of styles - full, half, foldout, and vented. You'll have to decide which one is best for you. We like the full windshield with a vent for the best combination of comfort and protection. If you run a windshield, dust tends to get sucked back behind you and can get old in a hurry. A rear windscreen of some sort can help solve that problem. Vents in the windshield also help. Polaris Ranger Cabs and Tops - Tops help keep the sun out and can provide some protection from flying debris. Full cabs provide the ultimate in protection but aren't really practical in hot weather. Polaris Ranger Bumpers and Racks - Some owners prefer heavy duty bumpers with integral brush guards for heavier duty riding. Racks can provide storage for more equipment or just things in general. Gun racks are popular with hunters. Polaris Ranger Guards and Skid Plates - When the going gets really rough it's time to think about skid protection for the bottom of your Ranger. Rocks, roots, stumps and other nasty stuff can do a number on the exposed parts underneath. Polaris Ranger OEM Parts - We also included deals on the Polaris Ranger parts that just need to be replaced due to normal wear and tear. Oil filters, air filters, belts, brake pads and more. Polaris Ranger Parts - See every part listed for Polaris Ranger UTVs.